Black Country favourites Left For Red were practically suckled on Heavy Metal and the DNA of local heroes Sabbath and Priest is indelibly imprinted on their very sonic soul. The five-piece have been throwing riffs around like confetti for a number of years now and this sophomore album cements their well-deserved reputation as one of the Midlands’ most energetic and engaging outfits. These fellas play with so much passion you almost have to scoop it back in when it comes oozing out of your speakers like an overcooked soufflé. With rhythmic cuts so infectious you’ll almost need to bandage them up, Human Complex is full of testosterone-fuelled layers that challenge you not to exercise your neck muscles. 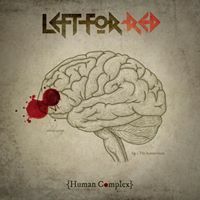 Having performed in recent years on such showcase stages as Bloodstock, Hammerfest and HRH Metal, it’s no surprise to see Left For Red deliver an album embedded with so much confidence and conviction. Human Complex starts powerfully with the morose but melancholic ‘Dancing With Misery’ which has an earthy doom feel and reveals very little of the metal side of their nature. That though is not long in coming as ‘Switchblade Romance’ is pitched at a much higher tempo, initially building mood through a strong stomp before we’re caught unaware by an aching chorus that draws comparisons with the likes of Killswitch Engage and 36 Crazyfists at their most vivacious. ‘Slaves To Causality’ is another steady slow burner, overlapping vocals in union with a fuzzed up riff. On great sweeping numbers such as the rousing ‘Leech’, Left For Red kick up the kind of sonic stampede that Orange Goblin would happily take a bow for. By way of contrast, Left For Red venture towards ballad territory on ‘The Storm’, cleanly sung and intimately executed as the Black Country crew reveal the flip side to their nature with heartwarming harmonies and a majestic melancholic vibe. The album explores a range of emotions and vulnerabilities, mental health and wellbeing among them. Human Complex itself is a reference to the often quoted ‘God Complex’ and really highlights how our words and deeds can impact on others, more often than not in a negative way. There’s messages of anger and love carried on these songs exemplified by the fiery ‘Tame The Tides’ and the more introspective emotive album closer ‘Sunrise Bring Serenity’. Left For Red will be performing an album launch show at the Birmingham Institute on April 6. They will also be among the acts sharing a stage for Mosh Against Cancer 4 at the Arches in Coventry on June 27.